Reproduction Toro Wheelhorse tiller bracket. Complete with new pulley and idler and belt tension spring and mounting bolt. What you see in the first pictures is what you will receive. The last pictures with it mounted to the tractor is pictures of my OEM bracket for reference. Complete with new pulley and idler and belt tension spring and mounting bolt and new toro belt. What you see in the first pictures is what you will receive. The last pictures with it mounted to the tractor is pictures of my OEM bracket for reference. 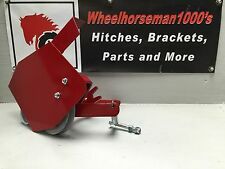 Toro Wheel Horse hitch #104659 SNOW DOZER BLADE TILLER BRACKET! NEW! This is a NEW rear axle bracket for Wheel Horse Tractors. The bracket fits all B Series, C Series, 300 Series, 400 Series & 500 Series and the 800 special. It does NOT fit the XI tractors. This is a Reproduction tiller / dozer / snow / rear mount grader blade axle bracket / mount. 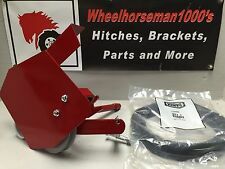 5 out of 5 stars - Toro Wheel Horse hitch #104659 SNOW DOZER BLADE TILLER BRACKET! NEW! 5 product ratings5 product ratings - Toro Wheel Horse hitch #104659 SNOW DOZER BLADE TILLER BRACKET! NEW! This is a NEW rear axle bracket for Toro Wheel Horse. The bracket fits all B Series, C Series, 300 Series, 400 Series & 500 Series and the 800 special. It does NOT fit the XI tractors. This is a Reproduction tiller / dozer / snow / rear mount grader blade axle bracket / mount. This is a reproduction of the Toro Wheel Horse tiller gearbox gasket #6851 that is NLA from Toro. This gasket is #14 in the parts breakdown. You will receive (1) gasket. HAS SMALL DENTS FROM KNOCKING AROUND IN STORAGE. But clean inside. Has 1/8" pipe thread outlet on bottom. of tank, note location of outlet in photo, this outlet is on the bottom, opposite side of tank in relation to filler cap. Ariens Rocket Tiller Wheel Horse 653 Tillers 7HP Engine. 1x Carburetor Kit as the picture. We will try our best to reduce the risk of the custom duties. This kit replaces toro numbers 93-1603-03 and 93-1602-03. The original tines from Toro are all welded onto the center pipe. This kit the tines bolt to the rings welded to the center pipe so tines can be replaced. This kit includes the 16RH 16LH tines, 64 bolts, and 64 lock nuts for the wheel horse 50" PTO drive tiller. Toro wheel horse reproduction bracket lock/lever and locking pins. This hitch mounts to the rear axle to attach a 42” or a 48” DOZER BLADE (snowplow) or a ROTOTILLER to the tractor. WHEELHORSEWheel Horse snowplow, tiller bracket for rear axle 104659-01. This is a used rear axle bracket for Wheel Horse and TORO/WHEELHORSE Tractors. 36" Tiller for 260 300 5xi Garden Tractors. 07-36TL01, 36" Tiller, 1980. 07-36TL01, 36" Tiller, 1981. 07-36TL01, 36" Tiller, 1982. 07-36TL01, 36" Tiller, 1983. 07-50TL01, 50" Tiller, 1980. 07-50TL01, 50" Tiller, 1981. 07-50TL01, 50" Tiller, 1982. Up for sal e is a LH Coverfor Toro Wheel Horse tillers. Part number 101975. 07-36TL01, 36" Tiller, 1980. 07-36TL01, 36" Tiller, 1981. 07-36TL01, 36" Tiller, 1982. 07-36TL01, 36" Tiller, 1983. 07-50TL01, 50" Tiller, 1980. WHEEL HORSE WT-30 TOW BEHIND TILLER, ASSEMBLY OPERATORS AND PARTS LIST ORIGINAL! 07-06CL01, 32" Bagger, 1980. 07-06CL00, 32" Bagger, 1980. 07-36TL01, 36" Tiller, 1980. 07-36TL01, 36" Tiller, 1981. 07-50TL01, 50" Tiller, 1982. 07-50TL01, 50" Tiller, 1983. 07-36TL01, 36" Tiller, 1982. Wheel Horse dozer blade rear mount latch. 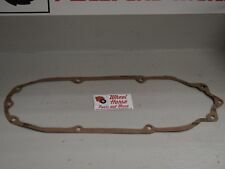 This is a Wheel Horse/ Toro 30" Tiller Belt. Part No. 108971 (30E4"back"). NOS parts may be a little dusty and / or dirty but are NOS. Part Number: 109630. These parts may be dusty, dirty, have surface rust, be scuffed or scratched. (Cub Cadet, Troy Bilt, Kohler, Briggs, Tecumseh, Polaris, Arctic Cat, Suzuki, Wheel Horse, Bolens, Mitsubishi Satoh, Murray, Stihl, Husqvarna, [Car parts: tons of classic Porsche 944 parts!] }. ). Built for strength and endurance. SEARS # 48530. LAWN BOY #. WHEEL HORSE # 1590. SNAPPER #. SIMPLICITY #. GRAVELY #. MURRAY #.